Today I want to share with you a pleasant discovery - new beautiful WordPress themes (themes) for the blog.For a couple of years of work on the internet I had to deal with different content management systems. Some touched only superficially (as, for example, made ​​two stores on the vamshop , the other had a long time to work, learn and accumulate knowledge - about the TYPO3, I wrote the article partly work on the Internet - web programming . 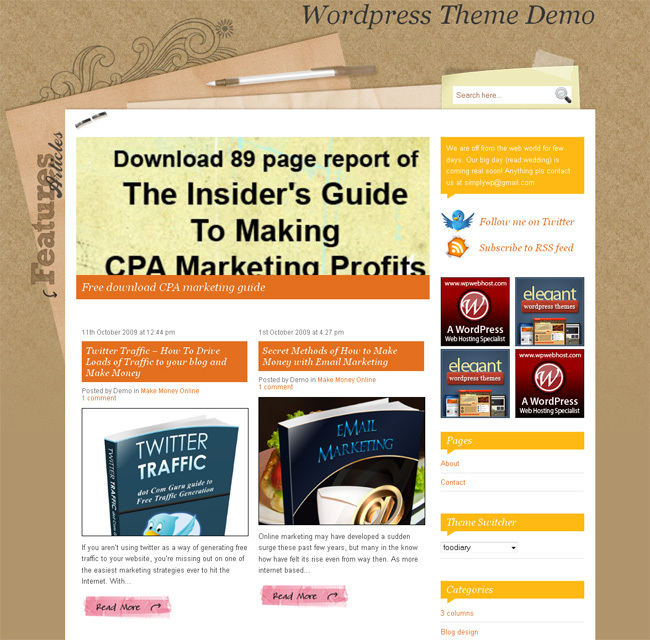 But now my attention was entirely devoted to Only WordPress - a system that mainly designed for creating blogs. All of my blogs and sites that they like working for this great CMS. Of course, it is not without flaws, but allows you to create beautiful, comfortable designs for men. 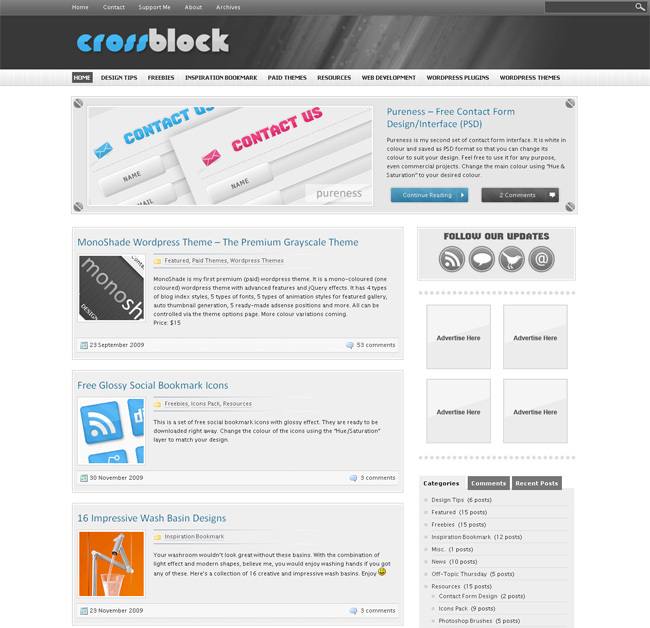 One of the first steps in creating a new project is the selection of WordPress themes . Sometimes it can take several hours - in fact in the network are so many interesting functional designs, although not all of them will attract your attention. A lot depends on the subject and focus of the project, but most often I choose wordpress themes are not only visually appealing but also have a certain set of functions necessary for me - in most cases it is a three-column layouts. But even taking into account this factor, the choice still seems to be very difficult due to the large number of designs. By the way, recently found some interesting and beautiful wordpress themes, you may enjoy and be useful for their projects. This wordpress theme consists of 2 columns, supports widgets, and contains almost all the necessary pieces of information for the site - archive, categories, recent posts, tags. There are two menus, one of which is a drop-down, a separate allocation for the "selected" articles with a nice switch, and a large stylish footer where you can find the block "on the project", occasional (receive a random) posts and photos from the Flickr photo sharing site .In general, very, very attractive wordpress theme for personal or topical blog. This wordpress theme is suitable for projects of any niche - a clean and elegant design combined with good functionality (all the way I like :) From the main options are: blank advertising banner at 125 × 125 and 468 × 60, 2 speakers, support Gravatar , widget Twitter. The template has a fixed width, seo optimized, the archive will also find some files. PSD. 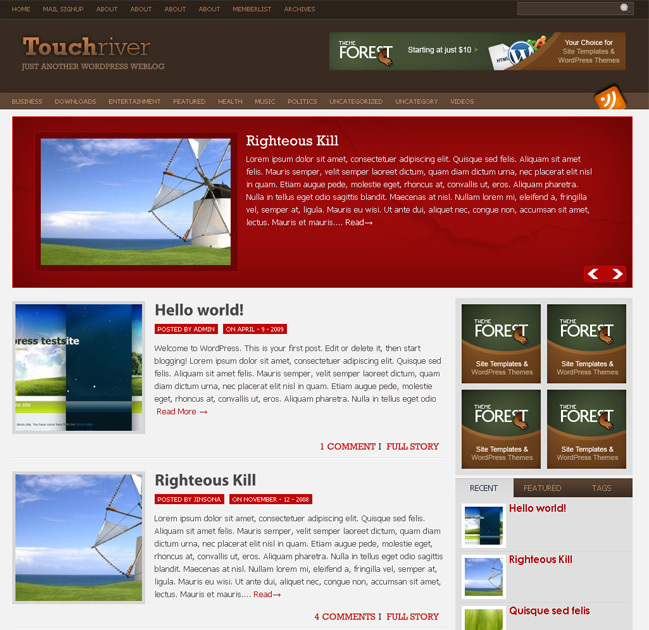 In the development of tested compatibility with major browsers IE, FF, Safari. Foodiary - a three-column wordpress theme supports widgets, customizable features and advanced footer. In the latter you will find a calendar, recent posts and comments . Pattern has a very original design with elements of informal sketchevogo style - handwritten inscriptions, background of the notebook, all sorts of pieces of paper, pen, etc. Some of this you can see in the picture above the template. In addition, it is: a place for banners 125 × 125, a stylish automatic switching "selected articles", the social buttons (Twitter, subscribe to the RSS, adding a bookmark), automatic generation of image positions, the unit blog search, navigation, gravatars, tree-like comments. 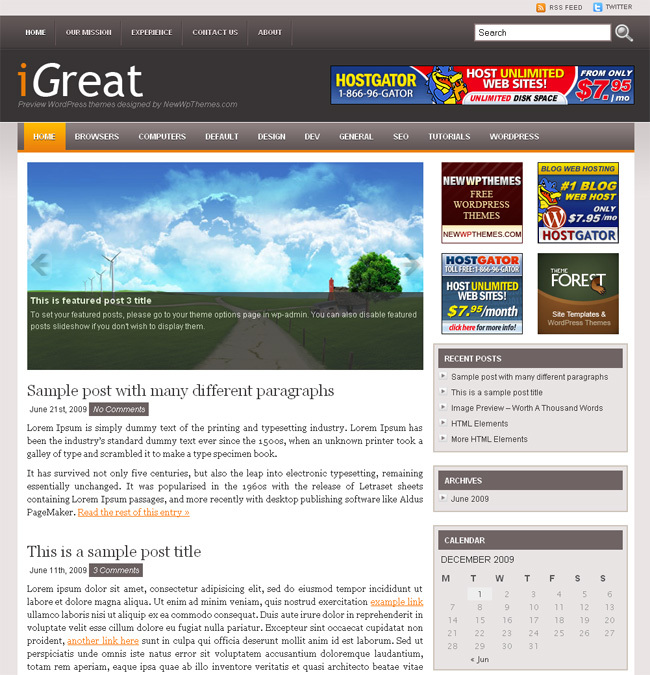 This wordpress theme has been tested in all major browsers, IE7, 8, Firefox, Safari, Opera, Chrome, is compatible with wordpress 2.8 and other versions of the system. Beautiful free wordpress theme with features of premium templates, such as an animated change of elected positions, display photos from flickr, the publication of recent tweets, social bookmarking buttons and more. The design is almost in monochrome black and white, has a fixed width, gravatar support and widgets. Tested on FireFox, IE6, Opera, Safari, compatible with different versions of WordPress up to 2.8.3 (although I am sure that will work with future versions of the branch 2.8). In the sidebar you will find tabs to save space, where the output categories, comments, and recent posts. Template has been prepared for integration with Google Analytics, Adsense, Feedburner, and Webmaster Tools, plus as mentioned above - works with Twitter, Flickr. In general, what is called "complete mince." But that's not all - in this wordpress theme code built to support the display of navigation, the connected stations, automatic detection and display of the most popular articles, support sites for banners and comments in the CSS files for easy modification patterns. What can you want? - In my opinion, there is everything! I hope the collection of WordPress so (themes) you like - there is also the original design patterns, and functional, and stylish - in short, for every taste.